iPhone users can now exhibit full control over the content playing on their Xbox 360 console thanks to an update to the My Xbox Live app. Version 1.5 of the application (also available for iPod touch) brings play, pause, rewind and fast-forward controls, as well as access to the four coloured buttons. The free update also adds the Quickplay mobile dashboard functionality seen in the Windows Phone version. This allows users to start games or entertainment apps - iPlayer, YouTube etc - or discover new content directly from the handset. The new app isn't available for iPad yet, although the tablet version has been upgraded to account for the new Retina Display on the new iPad 3. Alongside the iOS enhancements comes the first iteration for Android phones. However, that app doesn't bring the Quickplay or remote control options. By enabling downloaders to connect with Xbox Live friends, view achievements, customise avatars and edit their profiles, it simply does what the iPhone version did prior to today's revamp. 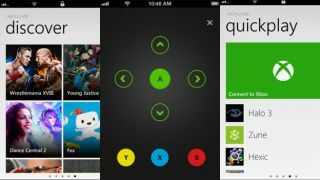 The Xbox app team has had a busy time of it in recent weeks having launched the AirPlay-like SmartGlass application at E3 2012.